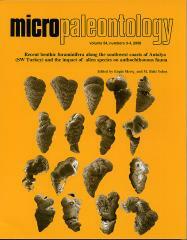 ABSTRACT: We studied a total of 24 genera and 41 species of modern benthic foraminifers with colored shells from 49 samples collected from the GÃ¶kÃ§eada region, southwestern Bozcaada, eastern Mitilini in the northeast Aegean Sea and from different points along the shores of southwestAntalya. d(104) reflection andMgCO3 content of shell calcite vary between 2.979-3.035Ã…and 0.33-19.00 mole%, respectively. Mg/Ca and Sr/Ca ratios of whole shells range between 2.95-51.51 and 1.45-10.44 [mmol/mol]. These values are normalized to maximum and minimum concentrations in chemical analyses from whole shells and shell surfaces in colored and colorless foraminifers. Enrichments inmetallic elements seem to be related to absorption depending on qualitative and quantitativemeasurements of shell structures, although variations are also related to mineralogical composition of shells. Hypothetically ions transferred with hot waters from active faults on the sea-floor and/or the ions transportedwith cold water runoff from landmay cause abnormal enrichment of some metals within foraminifer shells and/or secondary metabolic enrichment of foraminifer shells during life.